Rumors of new Nvidia desktop graphics cards seem to have all but dried up, but we might possibly see new GPUs coming to laptops. A Gigabyte/Aorus UK Notebook representative on the OverclockersUK forum confirmed laptops equipped with next generation Nvidia GPUs are scheduled to release towards the end of the year – though this rumor requires some extra extrapolation to be taken at face value. 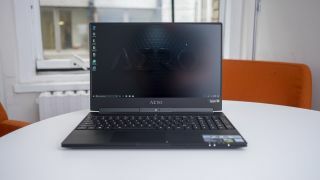 The bombshell was dropped in response to another user asking if there was another higher-spec Gigabyte Aero 15 X coming soon – so given that and that Gigabyte only uses Nvidia discrete GPUs the next generation graphics would have to a new part from the Turing family. We wouldn’t normally put much stock in a single forum post, but it seems more credible coming from a brand representative posting to a retail site with direct partnerships to both Gigabyte and Nvidia. The forum thread has since been taken down, but it seems the Gigabyte/Aorus UK Notebook representative is still an active member, so it seems like the forum user is at least genuine. Despite a lack of movement on new desktop graphics cards, Nvidia has launched a new series of laptop GPUs with no desktop equivalent in the past – as evidenced by the Nvidia GeForce 800-series on notebooks but not desktop cards. What does this mean for Nvidia Volta?